In this class we will focus on the fundamentals of Pilates. A strong foundation is critical for a true Pilates practitioner. Choose this class if you have never done Classical Pilates or if you feel like you need a refresher. We will all be supportive of one another. 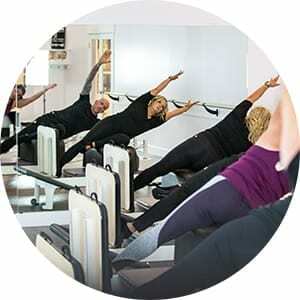 We will go over a brief history of Pilates, correct positions, key cues and how to adjust tension on the Reformer so you feel well prepared for the other classes offered. Flow = a flowing transition from one exercise to the next. Minimum spring changes, consistent movement and a new appreciation for what your body can do. Join up to 5 friends for 55 solid minutes of Reformer fundamentals; you guided the entire session. Learn and build on the basics as Joe Pilates intended. We move the spine, work the core, build stamina and leave you with more energy than you came with! Get the necessary cardio and impact we all need for our joints and bones in the most gentle and effective way; jump board! As we age we lose cartilage. Impact is necessary to send the signal to our brain to continue to build that necessary cartilage. In 30 minutes we will warm, maintain a higher heart rate that will create fat burn for hours/days to come and of course then stretch. The perfect lunch hour (30min) workout! This class is great paired with Reformer before or after. Jump board is also a great option for those with osteoporosis, spinal issues and so much more because your are supported by the carriage, you may also use very light resistance. If necessary as light as 10 pounds compared to your own body weight. Set clear intentions for the rest of the week with this high energy, faster pace workout! Amp up your regular routine and energy at the end of the day by taking this class that will leave you feel accomplished, tight and a little sweaty. riZe up in life. Show up in class the way you want to show up in the world; eager, ready and willing to be part of a collective force all working for the betterment of yourself and each other. Set to faster tempo music and higher energy this class will still hold Pilates principles of breath, control, balance, focus and centering. We will move in a circuit style setting and get a full body workout. Expect to work every large and small muscle, do cardio conditioning, and cool down with an amazing stretch all within an hour. All levels are welcome, in the circuit you can sit a station out while your heart rate recovers and move at your own pace while at each station. We will work on the Reformers, at the Barre, on the Wunda Chair, on the mat and do body weighted movements for functional training. Classes will be Thursdays at 7pm and each session will be different. Come join us in the fun! In a private session we can really address personal issues and goals. I can watch you move and your form solely to ensure safety and effectiveness especially for those with physical limitations or those wanting to do advanced moves. Attention to detail and specific home exercises can be given in a private Pilates session.